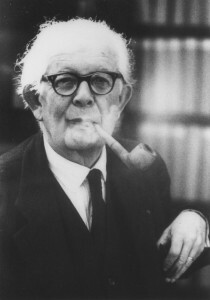 Jean Piaget was born on 9th August 1896 in Neuchâtel and died on 16 September 1980 in Geneva. When aged 11 years, he writes a short note about an albino sparrow that he noticed in a park. This brief paper is regarded as the starting-point of a brilliant scientific career indicated by nearly eighty books and several hundred papers. After gaining a PhD in natural science in Neuchâtel, Piaget spends a year in Paris with the successors of psychologist Alfred Binet during which he studies the problems of the development of intelligence. It was there that he laid the seeds of his method permitting him to establish his theory of cognitive development. In 1921, he is nominated by Edouard Claparède and Pierre Bovet to take up the post of Research Director at the Jean-Jacques Rousseau Institute in the University of Geneva. In 1923, he marries a student at the Institute, Valentine Châtenay. It is in their three children that he will study the development of intelligence from birth to language. He becomes in turn professor of psychology, sociology, philosophy of science at the University of Neuchâtel, professor of the history of scientific thought at the University of Geneva from 1929-1939, Director of the International Bureau of Education from 1929-1967, professor of psychology and sociology at the University of Lausanne 1938-1951, professor of sociology at the University of Geneva from 1939-1952, then professor of experimental psychology from 1940-1971. He has been the only Swiss professor to be invited to teach at the Sorbonne, from 1952-1963. He foundet the Centre International d’Épistémologie Génétique in 1955 he led until his death. Essentially, Piaget’s outstanding achievement will have been to recast completely our conception of children’s thought. His works on developmental psychology and epistemology set out to answer the fundamental question about the construction of the different kinds of knowledge. Across a range of studies that he has directed in studying children’s logic, he has been able to provide evidence in two parts. Children’s logic is progressively constructed following its own laws, and it evolves throughout life passing through different, characteristic steps before reaching the adult level. It is to Piaget that is owed experimental proofs that the modes of thought in children are fundamentally different from those in adults. Piaget’s oeuvre is available over the whole world and today still continues to have an inspirational influence on projects in such varied domains as psychology, sociology, education, epistemology, economics and law. He was awarded more than thirty honorary doctorates from different universities, the Erasmus Prize, the Balzan prize, and many other Genevan, Swiss and International honours. Piaget is regarded today as the greatest 20th century psychologist.